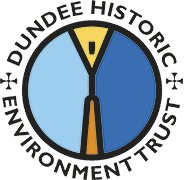 This walk is focused predominantly on Dundee's pre-jute history in the city centre and the shore. Between the early 15th century and the 1670s, Dundee was the second city of Scotland. Owing its pre-eminence to the safe anchorage of the Tay estuary, it developed as a great Baltic port. Its plan and its curving closes which joined the harbour to the High Street resemble those of Lubeck, and there are strong similarities with Copenhagen, and Gothenburg. Its Maritime Quarter - a dense district of winding closes and sheltered courtyards - lay between the market place and the sea. It was wealthy: the largest Greyfriars and the best appointed parish church in Scotland. Dundee's elite were Baltic merchants and traders, craftsmen, and ships captains. The Maritime Quarter contained ropeworks, block makers, ship's biscuit makers, ship's barbers and ship's surgeons. In 1644, the burgh constructed a warehouse down on the Shore called Packhouse Square - a miniature version of what you can now see by the shore of Hamburg. Once the seaport lost its pre-eminence to Glasgow in the 1670s, it reconfigured itself by importing flax from Riga, Danzig and St Petersburg, which was woven into Osnaburg cloth in the Forfar hinterland and then exported to Charleston and the West Indies. Whaling began to develop in the later 18th century - and whalers were huge. Whereas a transatlantic vessel might have a crew of 12, a whaler had a crew of 54. Where you are standing, was once sea. The town had reclaimed the foreshore for the dense closes and courtyards of the port's Maritime Quarter, but the Victorians desired a grander entrance from the railway stations. City Engineer William Mackison's replacement of the Maritime Quarter with Whitehall Crescent and Whitehall Street in 1875-7 was loosely based on contemporary Paris. Enter the town up Whitehall Street. The Broad of the Nethergate curves round - indicating the original Greenmarket - on a raised beach 50 feet above sea level. Curved closes ran down to the Shore (just as in Baltic ports like Lubeck). The aristocratic end of town, the earls of Crawford and Strathmore having their town houses here, it is dominated by Dundee's mother church - St Mary's. The High Street was Dundee's market place and centre of the town with the principal public building, the Tolbooth (later Town House), surrounded by the apartments of prosperous merchants. All streets entering the Market Place narrowed - the Seagate down to two metres - to keep the wind out of this 'outdoor room'. The sea originally lapped the foot of Castle Street. Probably on the 3rd November 1755, the aftershock of the Lisbon earthquake hit Dundee with a tidal wave of perhaps 50ft, which swept away the harbour and packhouses. When rebuilt, the shore level was raised 14ft higher at the sea end, and 5ft higher by Fish Street and the Maritime Quarter. This district is now becoming Dundee's Foodies Quarter - notable for cheese, coffee and fish. Turn left up Commercial Street, right along the Murraygate, and down Peter Street to Seagate, once the fourth street of Dundee running east along the sea edge. Here congregated whalers, whale boiling yards and the Sugar House. Left up St Andrew's Street, the Cowgate is at the top. 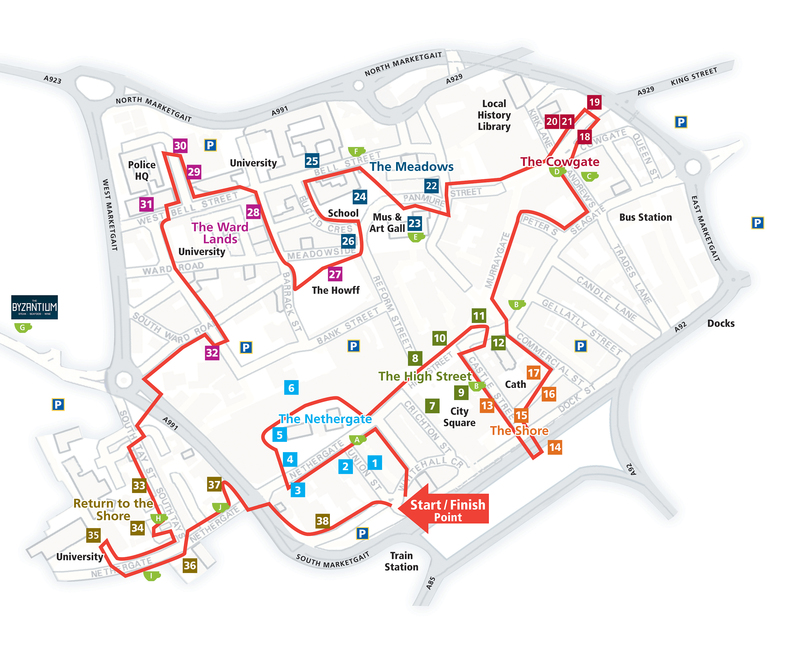 The ancient route for Dundee's cattle between the town's grazings at Stobs Muir and the market place, the Cowgate became the home to the Baltic merchants, shipbrokers, insurers and shipowners who did business in the open by St Andrew's. The town's water source - the Scouringburn - formed watermeadows behind the hills behind the north side of the market place. Here also was the town's mill pond. The Meadows became a place of fairgrounds, bleaching linen, market gardens and very poor foundations. In the early 19th century, the Council decided to locate all the principal public institutions there. The favourite place for walks and parades in Georgian Dundee, the fertile Wardlands ran westwards uphill from the Meadows. Here Dr Patrick Blair had established a museum and botanic garden in the 1690s. Some of Dundee's 19th century civic buildings were built here, later overshadowed by mills, calendering factories and warehouses. The roundabout marks the site of Dundee's West Port, the western edge of old Dundee. You are now at the northern end of South Tay Street, an 18th century suburb. Opened as part of a new trunk road between Coupar Angus and Dundee harbour in 1793. Couttie's Wynd, typical of Maritime Quarter closes running downhill between town centre and sea, was once a principal route between church and Haven, lined with apartments, houses and shops. Union Street, designed by the city architect David Neave in 1824, was typical of the wide new streets that ports cut in the early 19th century for increasing numbers of carts trundling between harbours and town centres. Note the large first floor 'Venetian' window of Dundee's Thistle Hall (or Assembly Rooms) opened in 1828. The Tower of Green's Playhouse cinema, designed by John Fairweather in 1936, signalled the second largest cinema in Europe. The foyer, which survives, was really designed by his nephew George Fairweather who was then working with the renowned '30s architect Joseph Emberton on the Blackpool Tower. The Mercat (Market) Cross, originally located in the High Street near Gardyne's Land, was largely designed by John Mylne in 1586, the unicorn added by Scott Sutherland RSA in the 20th century. The Auld Steeple is the 1470s tower of Dundee's Parish Church of the Blessed Virgin Mary which, with 48 altars and chapels, was the largest parish church in Scotland. Its crown spire was demolished by an occupying English army in 1549. The nave was rebuilt in 1792 as the Steeple Church; and the remainder rebuilt by William Burn after a disastrous fire in 1841. Known as the City Churches, it is the Church of the Guildry of Dundee. The Overgate Centre is a 2001 replacement of what, in medieval days, had been a principal street of Dundee with merchants' palaces and the Choristers' (of St Mary's) House. Crichton Street was widened from a curving close in the 1770s to provide a route from Market Place to harbour. Note the polychromatic office chambers with oriel windows designed by W J Anderson in the 1890s. On the left is the City Chambers by Sir John Burnet, 1924. Behind Crichton Street, explore ancient Ogilvie's Close, another curving close. Classical Reform Street, cut through hills from the market place by the architect George Angus in 1832, opened up the Meadowlands. Elegant shops and apartments, and some fine plasterwork. City Square replaced Scotland's finest baroque Town House in 1933. The Caird Hall, at the rear, was designed by James Thomson, 1914. Good stained glass in the City Chambers. The oldest parts of Gardyne's Land, a magnificent award-winning backpackers' hostel, is a 13th-century well, and 1593 timbers in the rear wing. The beautifully restored panelled chamber of c. 1710 on the top fl oor may be visited. Note the box bed. The Games Room is the former Dining Room of Dundeeis Georgian New Inn. Clydesdale Bank. The imposing 1776 Trades Hall designed by the city architect Samuel Bell closed the east end of the market place. Demolished during City Improvement in 1871, its puny replacement, the former Clydesdale Bank, was designed by William Spence in 1886. St Paul's Cathedral, designed by the London architect Sir George Gilbert Scott in 1853 for the Episcopalian community, sits on Dundee's old Castle Hill. Splendid atmospheric interior. Church House beside, built for Dr Willison in 1768, has two storeys of medieval underbuilding. Castle Street was cut through the Castle Hill in 1793 as a better access between harbour and market place. Some fine Georgian houses - note no. 26 (1825). The Theatre Royal, designed in 1809 by city architect Samuel Bell, has a bust of Shakespeare in its pediment. The Earl Grey (1824) and the King William 1V (1835) Docks, across the road from the Exchange Coffee House, were fi lled in for the Tay Road Bridge in 1966. The ponderously classical Exchange Coffee House, originally on the very edge of the docks, was designed by George Smith in 1828. Trading was done in the coffee room upstairs overlooking the ships. It was built on top of the remains of Packhouse Square, erected as a great cargo warehouse complex in 1644. They were marooned 14ft below ground level, when the harbour level was raised in 1756. A complex of vaulted warehouses and storm doors survives a storey and a half below ground. Exchange Street, opened above the submerged Packhouse Square and graving docks in the early 19th century, recalls the gracious, treelined open-air Merchants' Exchange of the Renaissance. City Mills. In the yard below St Paul's Cathedral on its Castlehill, to the right are the City Mills (rebuilt on medieval foundations in 1789 - now flats). Waters of the Scouring Burn still run beneath. The late 18th century apartment block on the corner of the Cowgate was embellished by the Grimond jute dynasty in 1888. Medieval in origin, the Cowgate was badly damaged in the siege of 1651, and most of the properties have been altered or rebuilt. There remains ancient fabric - look out for the painted glass window. King Street was opened in the later 18th century as an easier route for carts travelling between Dundee and Forfar than the steep Hilltown. In 1817, it was apparently lined with a gracious row of excellent white classical terraced houses by city architect David Neave. Except they were not. Behind their classical facade, the houses lie at an entirely different angle, occupying the backlands of the much older buildings of the Cowgate. Check out their front areas. The white-harled, octagonal Glasite Kirk was erected in 1777 for followers of the Reverend John Glas. It was known as the "Kail Kirk" since worshippers were offered bowls of cabbage soup. St Andrew's Church. 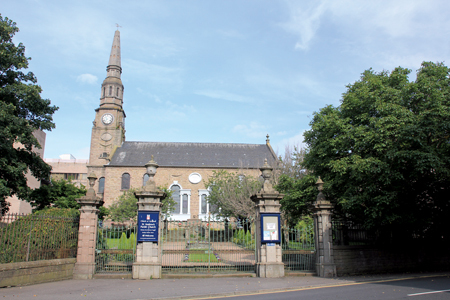 Designed in 1772 by city architect Samuel Bell, St Andrew's was partially funded by the Nine Trades, and is still the Trades Kirk. It was selected as the best new Scottish church by Thomas Pennant, and copied in Banff and Irvine. The interior has similarities to Gothenburg Cathedral. The Royal Exchange. In 1850, the 'Coogate', or Baltic Merchants, decided to relocate to the Meadows to build a Royal Exchange or Chamber of Commerce as part of a new business centre called Royal Exchange Square like Glasgow's. The architect David Bryce modelled his design on Dutch cloth halls. But the ground was too waterlogged. The Exchange's foundations kept on slipping, only stopping when Bryce's crown steeple was removed. Round the side you can see that parts of the Exchange tilt at an angle as steep as Pisa. Albert Institute/McManus Galleries. Between 1865-7, Dundee constructed the largest memorial to Prince Albert outside London as a working man's free reading room. The architect Sir George Gilbert Scott claimed to have invented a new modern Scottish style of his own. The galleries were extended eastwards, and then splendidly transformed by Page\Park, 2010. Excellent displays within, particularly the Orchar Collection of mid 19th century Scottish paintings. 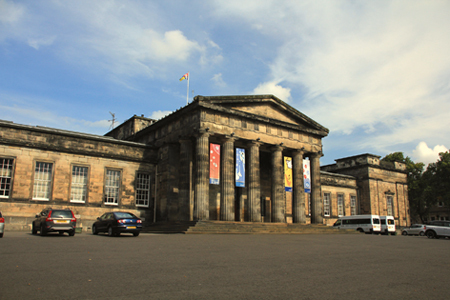 The High School, designed by George Angus in 1834, was the amalgamation of the old Grammar School and the Academy into one building. This magnificent school, with its Doric-columned portico, is one of the finest temples to learning erected in early 19th-century Scotland. Abertay University, founded as the Institute of Art and Technology in 1905 with Baxter money like Dundee University, was designed by J H Langlands. Abertay has now colonised most of Bell Street: note particularly its Library on the edge of the New Howff by the Parr Partnership. The Courier Building. One of the finest early 20th-century American buildings in Britain, and headquarters of the publishing firm D C Thomson - world-famous for comics such as the Beano and Dandy, it was erected for the Dundee Courier in 1902. The architects Niven and Wigglesworth were Dundonian who worked from London. Architectural cow pie. The Howff. Once the orchard of the largest Greyfriars in Scotland, the Howff was gifted to Dundee by Mary Queen of Scots in 1564, and walled in 1603. One of the finest ancient graveyards in Scotland, its arcaded west wall (one arcade per family) is matched only by St Peter's Kirk in Copenhagen. Magnificent carved 17th-century tombs mingle with the graves of Dundee's elite. The Watt Institution, precursor of Dundee University, was founded in November 1824 as a Mechanics Institution for the education of skilled workers. Its headquarters, designed by George Matthewson in 1838, included a library with 100 volumes, a laboratory on the ground floor, a lecture theatre above and a museum projecting from the rear. It closed in 1849. The New Howff, opened off Bell Street in 1825 as an overflow graveyard for plague victims, was designed as a 'picturesque' parkland cemetery running alongside the Newtyle railway line. Now a multi-storey car park with gravestones rammed against the wall, overlooked by Abertay University's russet Library. The Dundee and Newtyle Railway. So that it would not be left out of Scotland's growing rail network, Dundee began a railway line from its harbour over the Sidlaws into a small agricultural hamlet called Newtyle in Strathmore in 1825. The station was beside the New Howff, and trains were towed up before a tunnel through Dundee Law. Mad idea, and it never made a profit. The tunnel through the Law survives. The side wings of Dundee Sheriff Courthouse, Bell Street were designed in 1833 by George Angus, the pedimented courthouse by William Scott in 1863 and the smart extension by Nicoll Russell in 1999. Dundee House was created from the Victorian West Ward Calender (a factory for flattening and polishing jute) by Reiach and Hall in 2011 as the centre of civic administration. 18-27 South Tay Street is Dundee's finest classical suburban terrace, designed by city architect David Neave 1819-29. Note Neave's typical fanlights. Dundee Repertory Theatre, Tay Square was designed by Nicoll Russell in 1982. Scotland's only full-time repertory theatre, its interior is as magical as its programme. Dundee University Campus colonised former suburbia west of Park Place when the University purchased some late Georgian villas facing Perth Road going cheap in the 1880s. The landscaping makes the campus a delight to explore. Dundee Contemporary Arts, Nethergate, comprises art gallery, cinema and restaurant complex, won in architectural competition 1997 by Richard Murphy Architects. It is the largest modern art gallery outside London, and the keystone of Dundee's cultural quarter. Turn left down Nethergate, passing St Andrew's Roman Catholic Cathedral, an 1835 effusion in "plasterer's Gothic" with a surprisingly impressive interior by George Mathewson. The glazed Alliance Trust HQ was completed in 2009 by RMJM Architects. The Trust's origins lie in Dundonian investment in the American West during the mid 19th century. Blair's Court Cross the chasm of the Marketgait, and follow the Shore to the right then curving round to the left. Take the first close left. On the left is the rebuilt posterior of Green's Playhouse. Ahead is a mediaeval landscape topped by St Mary's steeple - the largest collection of buildings surviving of seaport Dundee. Three gardens, two courtyards - one with Renaissance arcades - dating from medieval and later periods: all waiting to be revived like Gardyne's Land.